KoopaTV: Suing Videogame Companies for Becoming Addicted? By LUDWIG VON KOOPA - That's what one clearly irresponsible moron in Russia is doing right now! Videogame addiction is a serious issue. It plagued Chad Joseph in hit KoopaTV game Trayvon Tyson's Punch-Out!! and it threatened to ruin my own life. Maybe it already has ruined my life and I just haven't come to grips with it. I thought that wait-to-play games could stop it, but if you end up being a cash whale then that's not helping. Now we're at the point where we're evolving in revenue models to pretty much be virtual casinos. Obviously, those are designed to get you addicted and lose your money for prizes of zero value. Sweet deal if you can manage it and rope kids in. But this isn't a passive-aggressive attack on Nintendo. It's... some level of defence. I guess. Turns out that in Russia, there is this moronic man who is suing Bethesda for 500,000 rubles (which is a little under $7,000) because Fallout 4 is too addictive. As a result of his addiction, he got fired from his job ('cause he was absentee) and divorced from his wife ('cause... who would want to be with a pitiful man who puts a videogame over their spouse?) and he's seeking vengeance. Apparently he just played it for three weeks straight and didn't eat OR sleep. Is he trying to put a third option in the Eating vs. Sleeping Splatfest, being "screw my biology I'll just play games day and night"? The money is for emotional distress. But is Bethesda responsible for causing emotional distress? In a twisted-logic way (which is what lawyers use, though our favourite lawyer—whose games are having a sale that's ending really quickly—does it affably) then Bethesda is indirectly responsible. After all, through their good game design, they totally captivated their audience into wanting to play! I swear, if we get big disclaimers proclaiming, "THIS GAME MAY BE ADDICTIVE" in the start-up for every game or on the game cases or as a replacement for the loss of instruction booklets, then I'll be mad. Russia doesn't even mandate those for cigarettes, though a lot of other countries do. Folks should be aware about addiction not through mandatory labeling that is an attack on free speech, but through... I dunno, common sense, I guess? Why didn't the wife just obliterate the husband's Fallout 4 copy in some dramatic moment? Throw it out the window! Just like Elaine did! Anyway, it's a matter of personal responsibility. We shouldn't punish Bethesda, Nintendo, or any other videogame company for making a game that completely grips your attention and won't let go. That's hard to do! That's a game design triumph, not something to be sued. Yeah... Seinfeld is just too good. 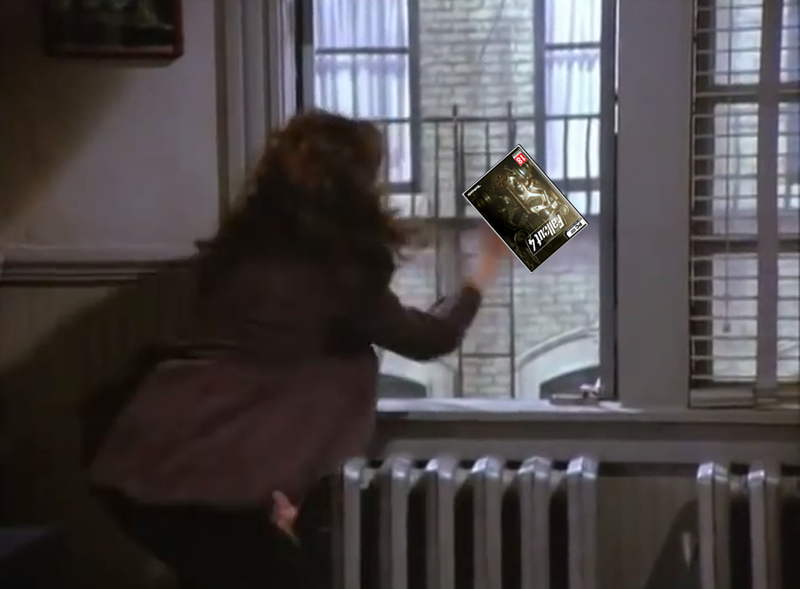 Everyone also remembers when Elaine actually DID throw Fallout 4 out the window! George just freaked out! Unlike cigarette-smoking, the majority of people who play Fallout 4 won't have their lives destroyed by addiction. (Not to say that smoking is a certainty of your demise — look at Mark Block!) Videogames exploit pre-existing tendencies within people. They don't create new ones like smoking would. If I'm scientifically wrong on that, show me. And most people don't have those pre-existing violently addictive tendencies. I consider it a lot more noble to be an achievement of psychology than to be an exploit of chemistry. Is that a legal defence? No, but Fallout 4 was a tool for the people who ditched that guy to cause his own emotional distress. Maybe he should sue his company or his ex-wife for emotional distress, and not the game. Or, obviously, he should just take responsibility for being a sucker and have the courage to seek help. Maybe he can't afford help and that's why he's suing for 500,000 rubles? By the way, 500,000 rubles is obviously just a made-up high round number. It's a shame that, if Bethesda made Fallout 2 as good in 1998, this guy could throw 500,000 rubles around and get the equivalent of $31,000. ...And for all the crap we give him, part of the reason for the ruble's collapse since then is thanks to sanctions by President Barack Hussein Obama. Thanks, President Barack Hussein Obama, for devaluing the complaints of a moron from Russia! Did Ludwig just say something positive about Obama? It's probably time to end the year on that note, but there's one more article to go for KoopaTV's (and everyone else's) 2015! If you've been paying attention, you'll know what it is. And if it happens to be really addictive (it isn't) then please don't sue KoopaTV! Here is that article and game. See if you're addicted. Gaming disorder is on its way to being an official illness! I at least know to prioritize my husband over gameplay. Examples are when during Splatfests I start late and there are way too many disconnects and barely any time left, I would stay at Champion rather than go to Queen/King. That keeps my frustration levels low which leads to a more pleasant household. For multiplayer platformer co-op games, we just go through the levels and getting whatever extras are on the way and easily accessible as my husband is not as good as those games as me. This is coming from someone who has a 200% file on Donkey Kong Country Returns (Wii version) which I did way before I even met him. I admit I still rage sometimes at these platformer games though I am working on that. Getting all stamps and Green Stars during a 2 player run in Super Plumber Kitty Boy was very aggravating though I did one player mode for Champion's Road and Mystery House Marathon and some green stars/stamps that were missed in earlier levels. Still working on finishing through Donkey Kong Tropical Freeze but not necessarily going for a 100%/200% run and NSMBU but not necessarily a 100% run either. 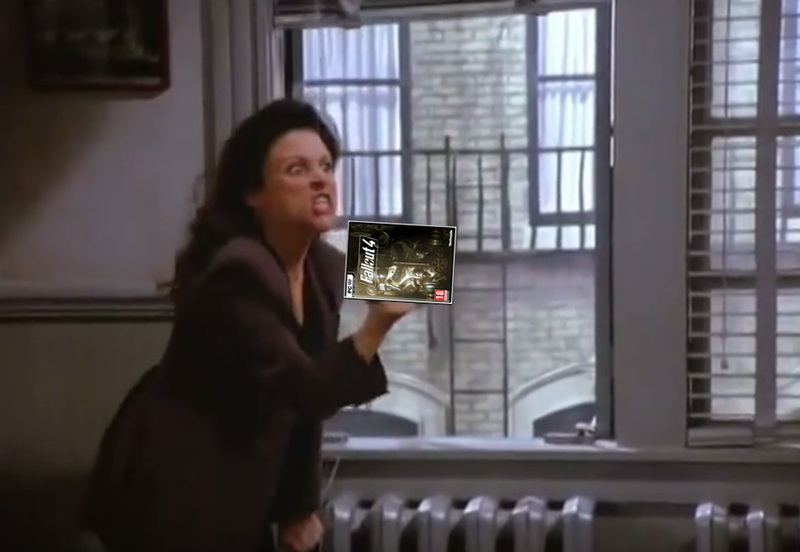 Games are meant to be enjoyed and I don;t want them to get in the way of our marriage. If you had this addiction illness, you might know in your head to prioritise your marriage, but you might not have the courage to do that. The real question is, would your husband sit idly if you did ignore him over gaming, or would he intervene? If the guy truly didn't sleep for three weeks in a row, then he broke a world record. And they say video games lead to non-productive lives! Of course, his very claim is unverifiable. I wonder if his lawyers can prove it in court? I doubt the guy was streaming the whole time or anything. Side-note: I don't consider Guinness book of world records to be a legitimate organisation, since you have to pay many thousands of dollars to get in for things like this. ...This is actually a thing that's happening? I saw headlines about it and assumed they were misleading clickbait, because surely this is just too absurd to take seriously. Unless Fallout 4 actually has some sort of hypnosis built into the game, which would be affecting more people, this guy doesn't have a chance. What if I write a really good book, and someone does nothing but read it? Suing me for addicting them would be ridiculous! I'm pretty proud that KoopaTV is apparently sterilised from being "misleading clickbait" in your mind! that pic of Elaine Bains though XD im so gonna spam that to my friends and say: "you see this? thats me when I come over( ͡° ͜ʖ ͡°)"
You... throw your friends' things out the window when you come over? !